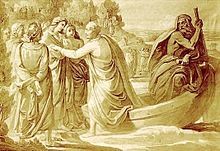 Elysium or the Elysian Fields (Ancient Greek: Ἠλύσιον πεδίον, Ēlýsion pedíon) is a conception of the afterlife that developed over time and was maintained by some Greek religious and philosophical sects and cults. Initially separate from the realm of Hades, admission was reserved for mortals related to the gods and other heroes. Later, it expanded to include those chosen by the gods, the righteous, and the heroic, where they would remain after death, to live a blessed and happy life, and indulging in whatever employment they had enjoyed in life. ELYSIUM, n. An imaginary delightful country which the ancients foolishly believed to be inhabited by the spirits of the good. This ridiculous and mischievous fable was swept off the face of the earth by the early Christians -- may their souls be happy in Heaven! Erichtho, Pharsalia as quoted by William Godwin in Lives of the Necromancers (1834), p. 112-113. But though the Shawnees consider the sun the type, if not the essence, of the Great Spirit, many also believe in an evil genius, who makes all sorts of bad things, to counterbalance those made by the Good Spirit. For instance, when the latter made a sheep, a rose, wholesome herbs, etc., the bad spirit matched them with a wolf, a thorn, poisonous plants, and the like. They also appear to think there is a kind of purgatory in which the spirits of the wicked may be cleansed before entering into their elysium. Josiah Gregg, Commerce of the Prairies (1844), Ch. 28: Aborigines Of America, p. 287. John Keats, Mermaid Tavern (1819). [From De Joinville]: Now, I hold that, in most matrimonial instances, it is as well to provide for repentance ; and wealth has its advantages and its alleviations in affairs of the heart, as in all other affairs. It was by means of a golden bough that Æneas passed the evil spirits of Tartarus, and gained Elysium in safety. Letitia Elizabeth Landon, Francesca Carrara (1834), Vol. II, Ch. 3. I thank Providence who has guided my destinies, that I now live; nay, that I live happier than a king of Persia. You know, fathers and fellow-citizens, that I am wholly occupied with this academical garden; that it is my Rhodus, or rather my Elysium. There I possess all the spoils of the east and the west which I wished for; and which, in my belief, are far more precious than the silken garments of the Babylonians, and the porcelain vases of the Chinese. There I receive and convey instruction. There I admire the wisdom of the Creator, which manifests itself in so many various modes, and demonstrate it to others. Carl Linnaeus, address to the University of Uppsala, on the anniversary of the king's birth-day (1752), After the creation of his botanical garden. In The Life of Sir Charles Linnaeus, Knight of the Swedish Order of the Polar Star (1794), Dietrich Heinrich Stoever, E. Hobson, p. 207. Also found in A sketch of the life of Linnæus : in a series of letters designed for young persons (1827), Harvey and Darton, London, p. 120. As quoted in A life of Linnaeus (1858), by J. Van Voorst & Cecilia Lucy Brightwell, London. p. 123: I render thanks to the Almighty, who has ordered my lot so that I live at this day; and live, too, happier than the King of Persia. I think myself thus blessed because in this academic garden I am principal. This is my Rhodus, or, rather, my Elysium; here I enjoy the spoils of the East and the West, and, if I mistake not, that which far excels in beauty the garments of the Babylonians and the porcelain of China. Here I behold myself the might and wisdom of the Great Creator, in the works by which He reveals Himself, and show them unto others." Must share the honours of Medea's bed. The Argonautics of Apollonius Rhodius (tr. Francis Fawkes) (1780), Book IV, lines 945–950; Hera to Thetis. William Shakespeare, Henry VI, Part 3 (c. 1591), Richard of Gloucester, scene ii. William Shakespeare, The Two Gentlemen of Verona (c. 1590s), Lucetta, scene vii. They came to a land of joy, the green pleasaunces and happy seats of the Blissful Groves. Virgil, Aeneid (29–19 BC), Book IV, lines 638–639 (tr. Fairclough). and those we remember well for the good they did mankind. Virgil, Aeneid (29–19 BC), Book IV, lines 660–664 (tr. Fagles); the blessed in Elysium. William Morris's translation of Inventas aut qui vitam excoluere per artis: "And they who bettered life on earth by new-found mastery"; a paraphrase of this is inscribed on the Nobel prize medals for Physics, Chemistry, Medicine, and Literature: Inventas vitam juvat excoluisse per artes ("inventions enhance life which is beautified through art"). The virtuous are then conveyed to Swarga or Elysium, whilst the wicked are driven to the different regions of Naraka or Tartarus. Horace H. Wilson quoting from Vishnu Purana, in "Works: ¬Vol. ¬7 : ¬The Vishṅu Purāṅa: a system of Hindu mythology ..., Volume 7", .